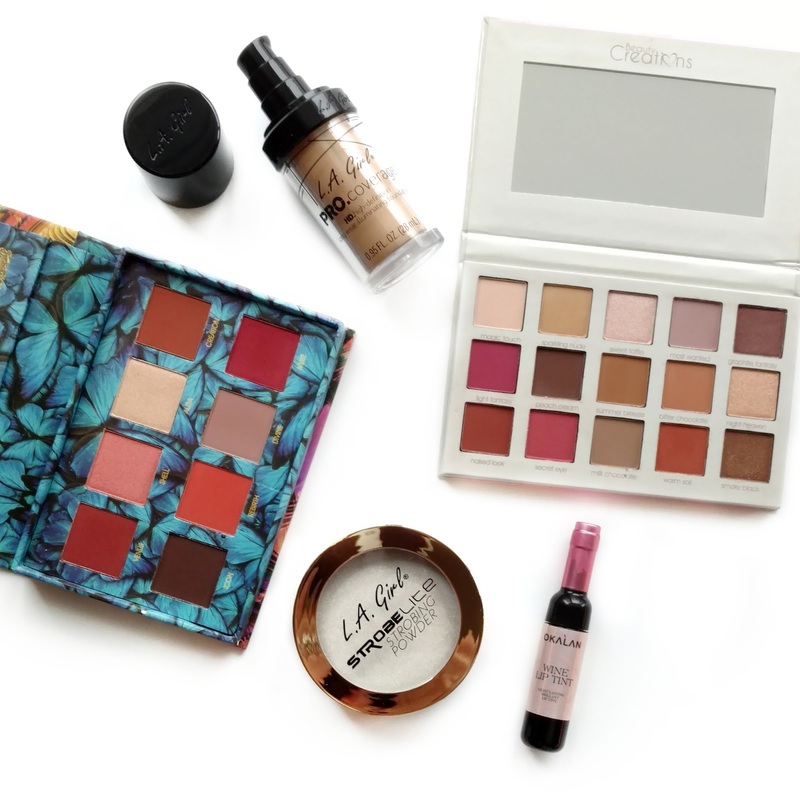 There's nothing better than finding awesome makeup at affordable prices, and I especially love when I stumble across those hidden gems that you can't find everywhere else. I was recently introduced to a shop from Los Angeles called Hush (shophush.com) and they have tons of unique products you won't find at your local drugstore (but they also carry well-known brands like Milani, e.l.f., City Color, and more). The best part is, everything you're going to see in this post was under $10 and I also have a coupon code below that will save you 10% off your next order! After I placed my order, I was really impressed with the service from Hush. My haul arrived in only two days (from Los Angeles all the way to CT) and the box was really well packaged...everything inside was intact and there were no broken items. 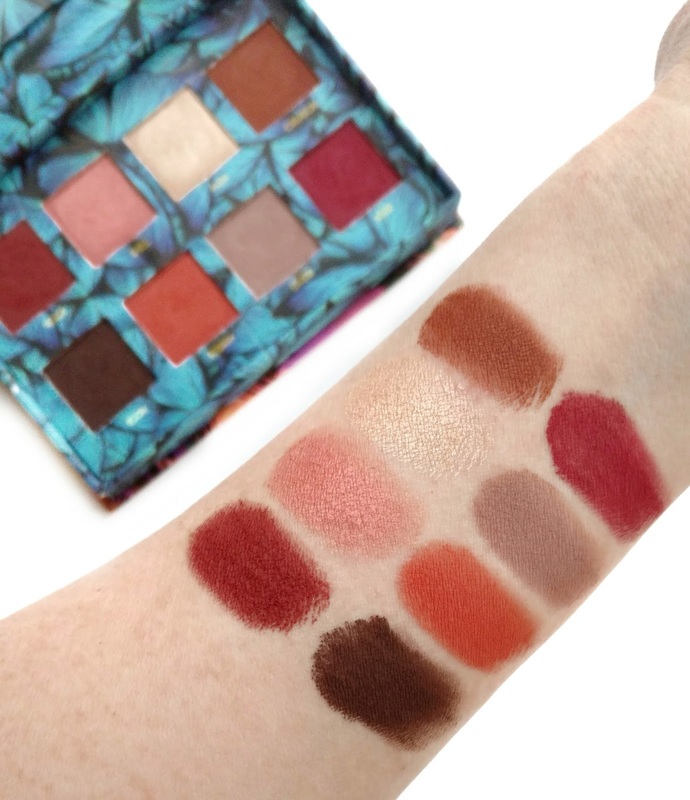 The first thing I was drawn to when browsing the site was the Oaklan Venus 8 Color Matte Eyeshadow Palette ($8). It actually reminded me a lot of another Venus palette that costs more than 3x the price! 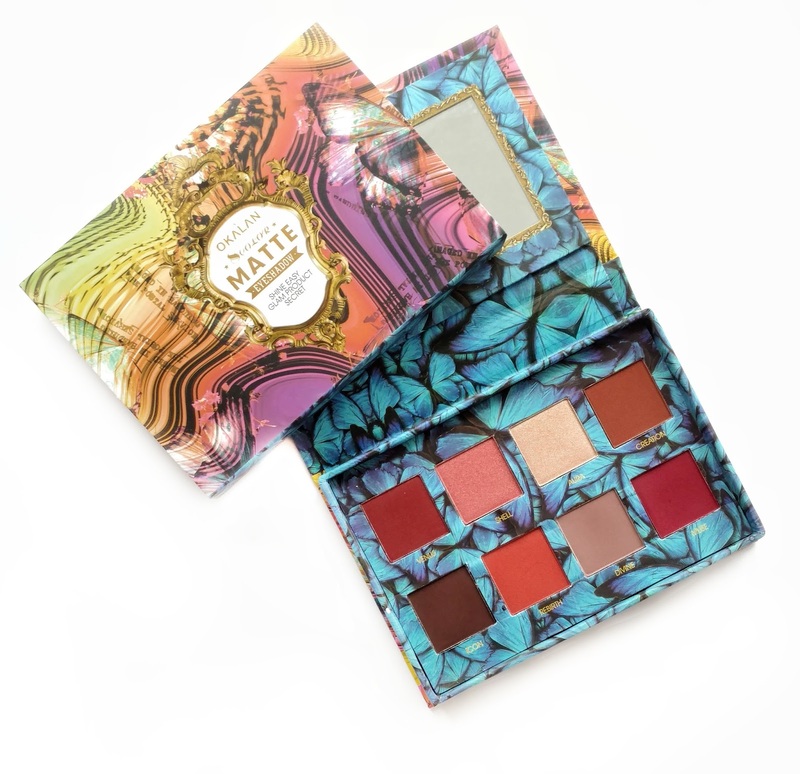 It includes 8 gorgeous warm shades and even though the brand calls it a "matte" palette, two of the shades (Shell and Aura) have a shimmery finish. 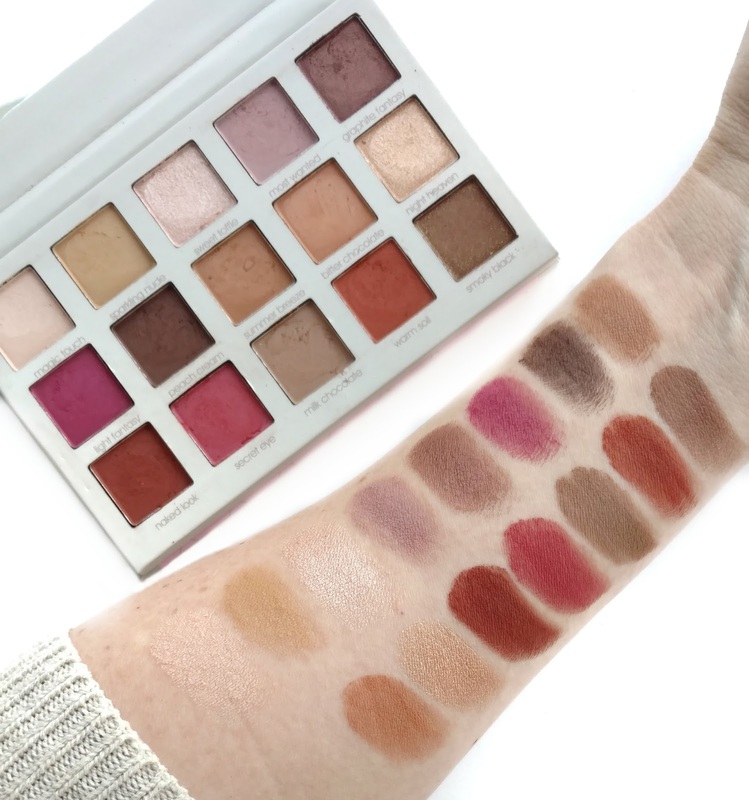 I was shocked when I went to swatch this palette on my arm...the pigmentation is great! A few of the deeper shades have a bit of dusty fallout when you pick them up with a brush vs. using a finger but tapping off the excess first, and using a primer to help them grip makes all the difference. And honestly, I don't mind at all since this palette is so affordable! 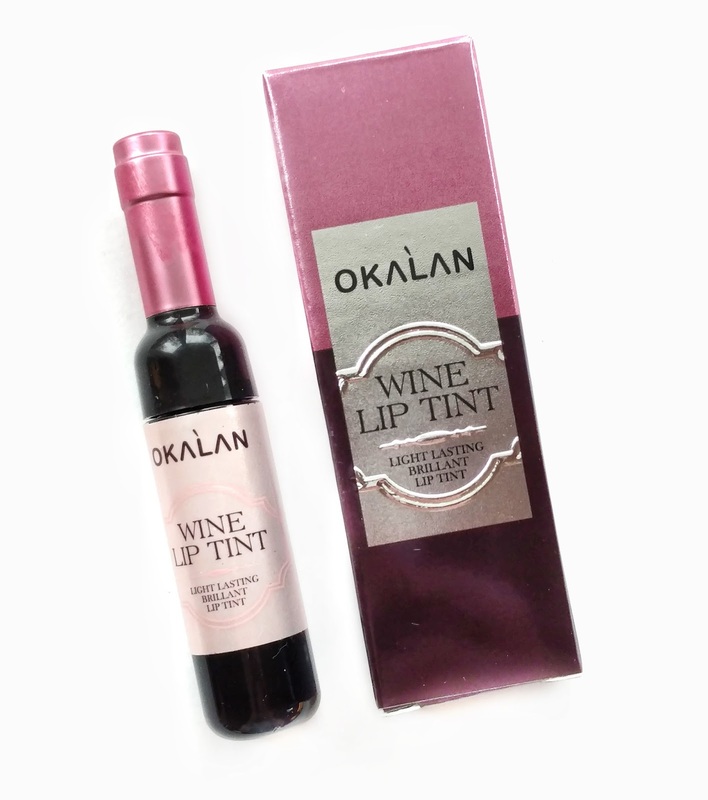 The next product I couldn't resist was also from Oaklan...it's their Wine Lip Tint ($3). How adorable is this little wine bottle?! There are six shades total and I picked up Blush Pink to try. 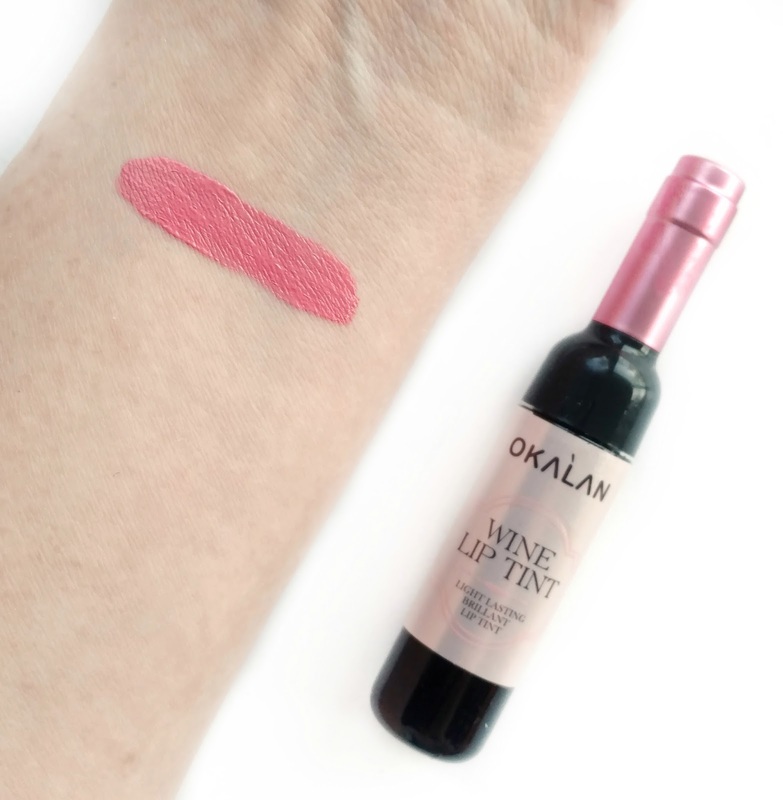 It comes with a standard doe foot applicator and the formula feels like a creamy matte liquid lipstick going on. But unlike a liquid lipstick, this is more of a stain. I apply it first with the applicator and then pat it in with my finger and it sinks in rather than sitting on top of your lips. The only downside is that I wasn't a fan of this color on me...it was a brighter pink than I was expecting. But at $3 a pop, I'm going to go back and grab a few more shades (they have some really pretty deeper red and wine-colored shades I might try). I was also glad to see that Hush carries L.A. Girl Cosmetics, especially since their prices are a few dollars less than buying them directly from L.A. Girl. 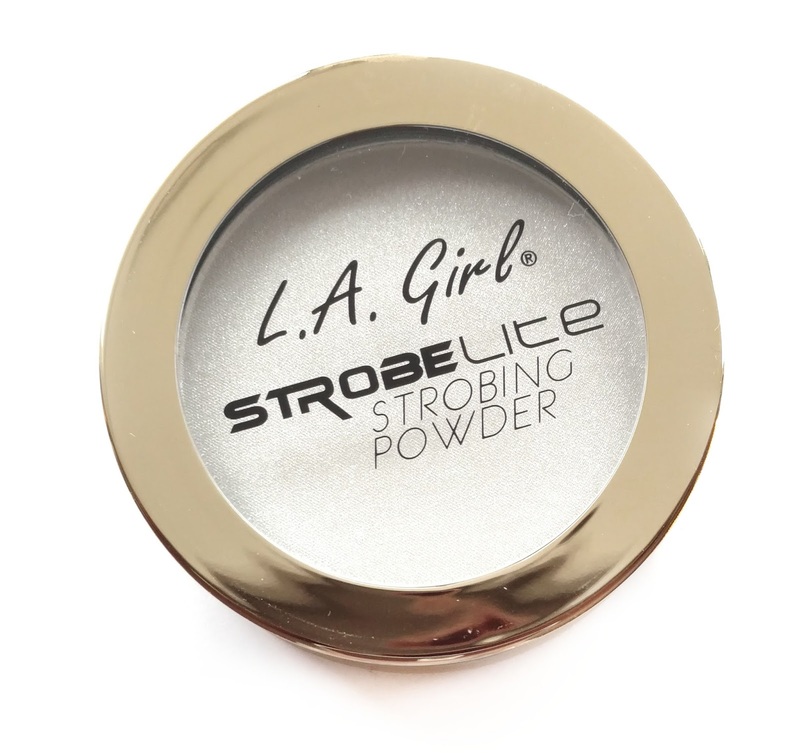 There are two products I've been dying to try after hearing the gurus on YouTube talk about them...the first one being the new Strobelite Strobing Powders ($7). They have a ton of different shade options, which is great because when you're really fair-skinned like I am, it can be difficult to find a highlighter that's light enough to show up. I chose the shade 120 Watt, which is the lightest shade they carry. 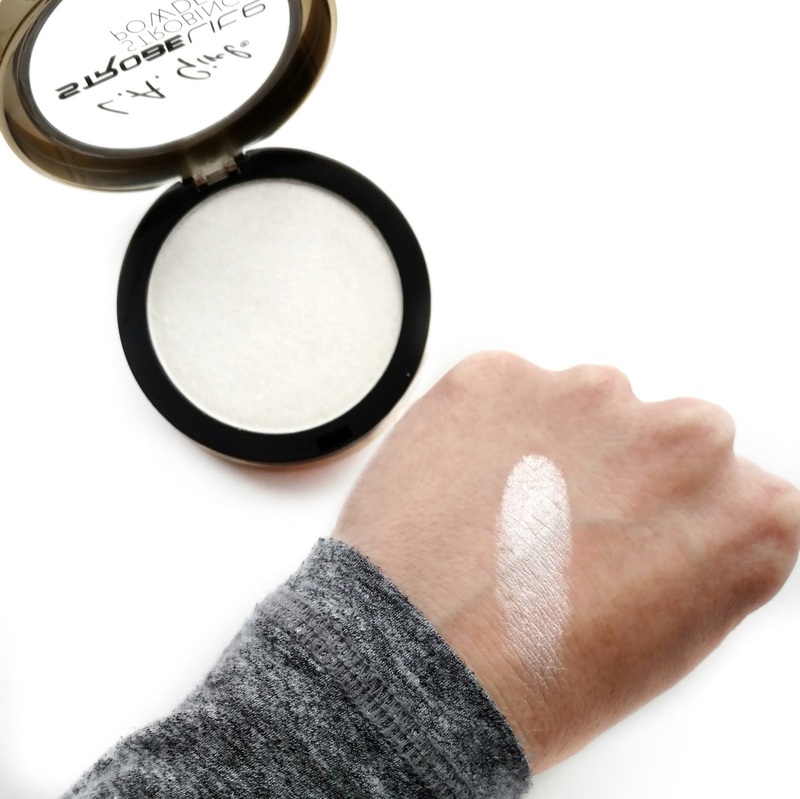 It's a super bright, silvery white shade that's really intense! 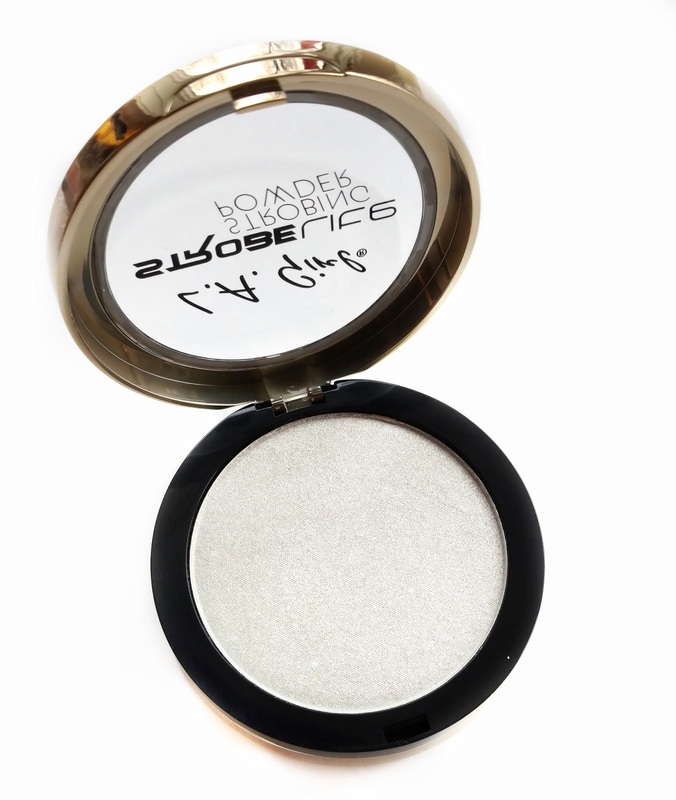 It does have a bit of glitter in it so if you love that intense, in-your-face highlight versus a subtle one, you'll love these! I might try 110 Watt next because it appears to be more champagne-colored, rather than white and might be a bit softer for everyday. I also couldn't wait to try the new L.A. 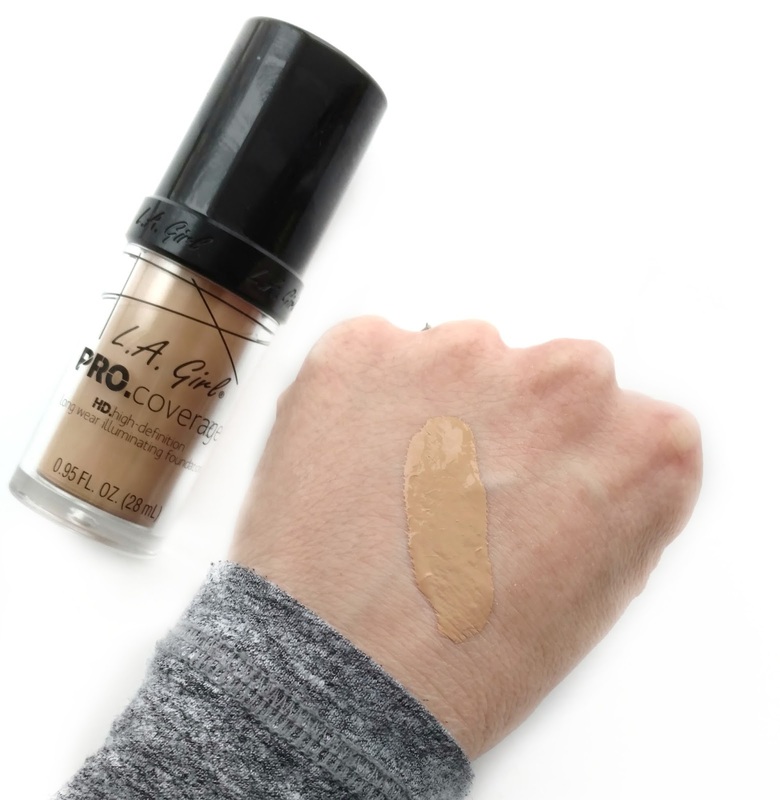 Girl Pro Coverage Liquid Foundation ($7) after hearing glowing reviews from Kathleen Lights and Tati on YouTube. I've only tried this once, but so far my first impression is a good one! My dry skin loves the dewy finish this gives and it can easily be built up to full coverage, yet it feels lightweight. My only issue is with the shade range, because it seems to run very dark. I purchased the shade Fair which is the second-to-lightest shade and it's a bit too dark for me. I can still make it work and I think it'll be perfect in the summer time, but right now, I probably need the lightest shade (Porcelain). 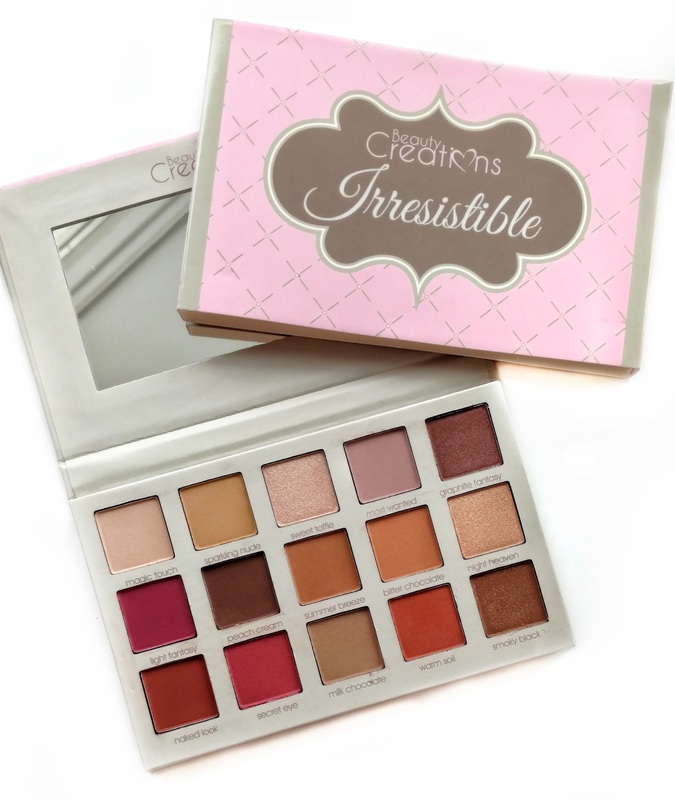 The last product I was dying to try was the Beauty Creations Irresistible Palette ($9). 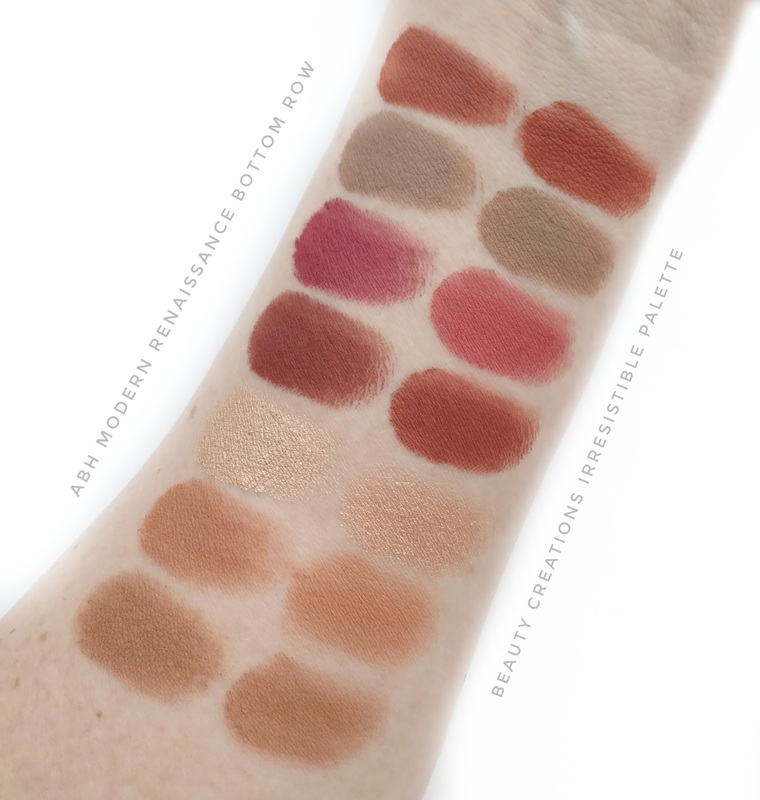 To me, it looked like a really close dupe of the Anastasia Modern Renaissance Palette so I couldn't wait to do some comparisons. 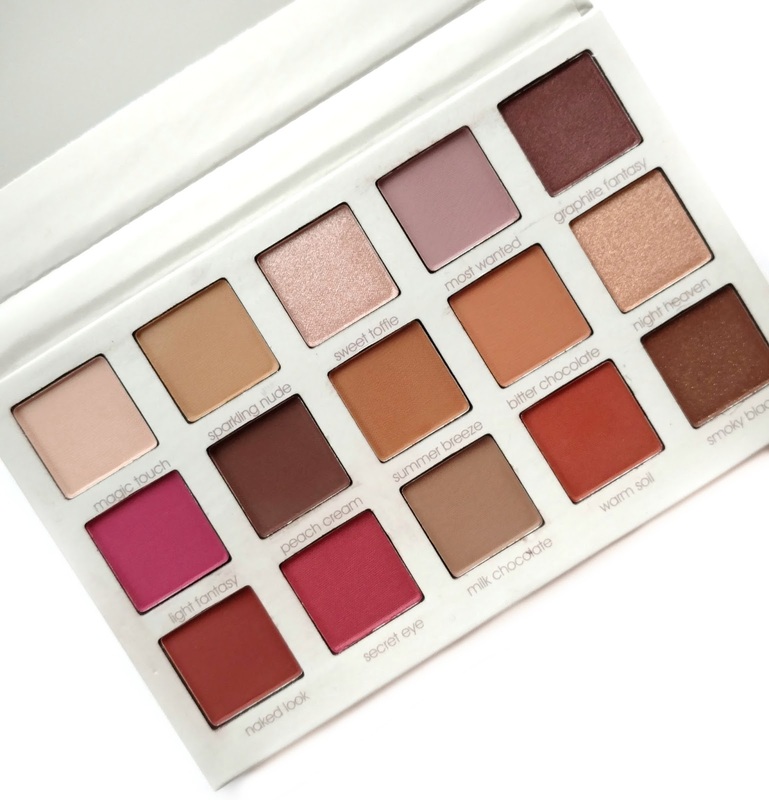 The palette is set up a little differently than the Modern Renaissance in that it has three rows instead of two. It also has one extra shade on the bottom right called Smoky Black (it's really brown though). 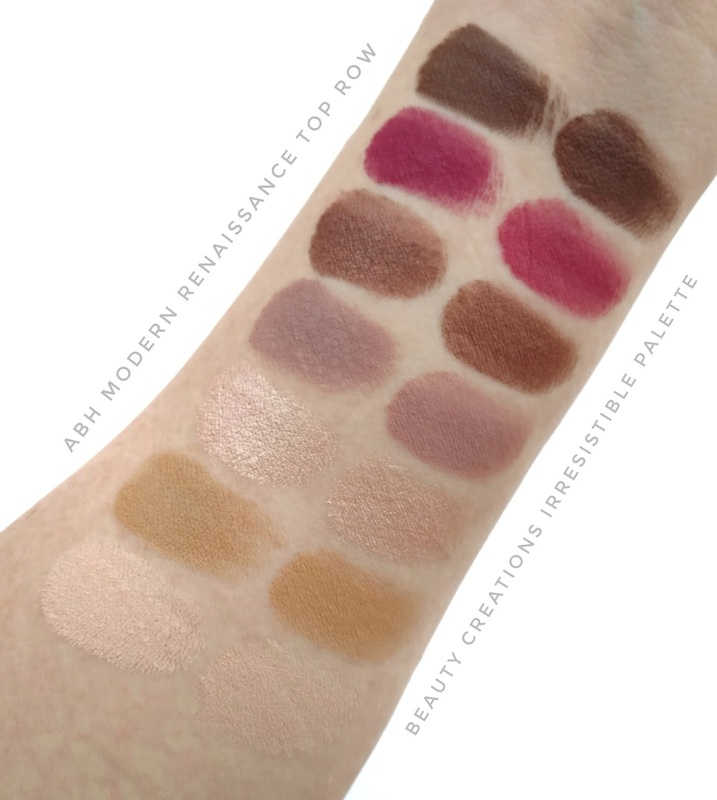 I think that the company may have printed the wrong names on this palette by mistake...on the website this palette has the same exact shade names as the Modern Renaissance palette, and this one has the same names as another Beauty Creations palette. Either it's a printing error, or they put these colors into the wrong palette by mistake. Either way, I'm not too bothered by it since it's such an inexpensive palette. Right out of the gate, it swatched better than I thought it would (these swatches are on bare skin, no primer). Some were a little bit dry and went on patchy (mostly the matte shades) but the rest were highly pigmented in one swipe and felt buttery smooth. So of course, you know me...I had to pull out my Modern Renaissance Palette to compare the two! This time, I swatched them both over primer and I was pretty wowed by the results. The Beauty Creations palette held its own against the Modern Renaissance for the most part! I haven't used it on my eyes yet, so I can't say how well it wears (I'll have to update you guys on that)...but for $9 you're getting the exact same shades which is pretty fantastic. The fact that it swatches this well makes me feel pretty good about how it's going to apply with a brush. OMG this is killer!! Thank you so much for posting this! I was just on their site and saw that they even have a Too Faced Chocolate Bon Bons dupe. I am gonna have so much fun adding things to my cart today. Are you buried in snow there too? I'm in NJ and didn't have to go to work today. I saw that TF dupe too...so cute! I wonder how it is! And yes, we got like 15" of snow!! We were in the house all day with no way out. LOL. I've been going a little stir-crazy, haha. So cool! 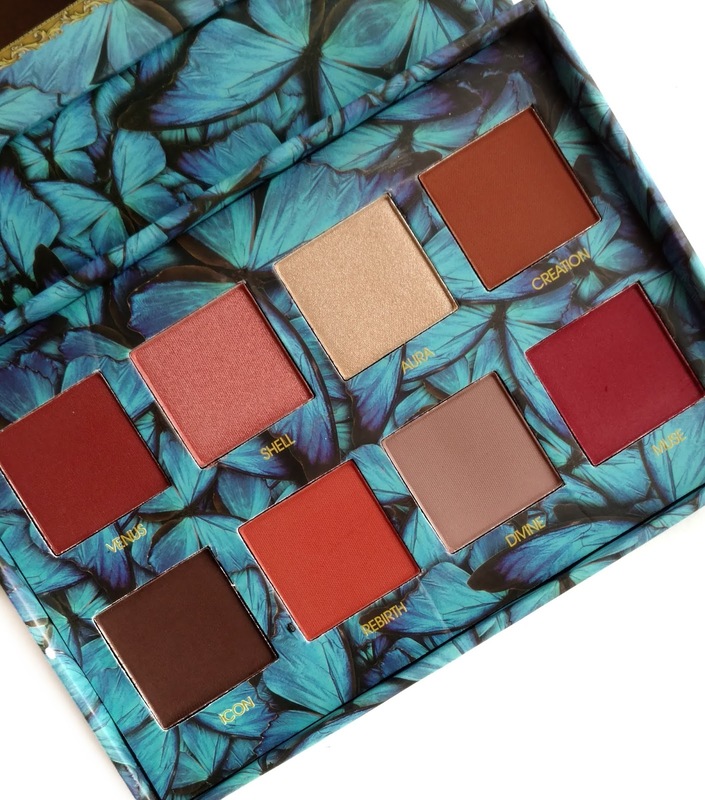 I always wanted that Lime Crime Venus palette and this is a spot-on dupe from what I can tell. Even the shade names are the same! I just didn't want to support the owner of Lime Crime after all the shady stuff that happened a few years back but I will definitely get this one. Thanks for always posting about new stuff! This is so awesome! I am checking out the site right now and am very impressed. Thank you for introducing me to this site! You're very welcome! :) Have fun browsing the site...they have a lot of really cute things. This is one of the many reasons why I continue to read your blog! You curate your content really well and instead of the typical sponsored posts for products no one cares about, you actually post about fun and interesting new products. Keep up the good work! Now, I'm off to look at the Hush website. Aw thank you so much Beatrice! I'm so glad you're enjoying my posts. :) I admit I have passed on many sponsorships because I just felt like they didn't really fit the theme of my blog. Writing here is something I enjoy so much, it doesn't feel like work and I really want to keep it that way, even if I don't make a lot of money. Plus, I know you guys don't come here to read commercials. :) The ONLY way I would do a sponsored post is if it was a product I truly believed in and would have posted about it anyway. I'm waiting until payday tomorrow but I will be getting the Aphrodite Valentines bundle with the Too Faced Bon Bon Palette dupe, the Modern Renaissance dupe, the Lime Crime Dupe, and some of those wine lip stains! Love this post and your blog! First time commenter here. I found you on Instagram a couple days ago and I just want to say where have you been hiding girl? I LOVE your IG page and your blog is great too. I'll be telling all my friends to follow you too. Love this post, I can't wait to check out the site. Awesome, sounds like a great haul, Jamie! :) I had my eye on that Milani foundation too. Those palettes look so pretty! I haven't been wanting to spend the money for the Modern Renaissance palette, even though everyone keeps talking about how awesome it is... I think I'll check out these palettes instead. :) Thanks for sharing!! They are definitely great finds...still don't live up to the original in my opinion, but for the price they're awesome! Wow this is such an amazing find. I really shouldn't be spending more money right now but I'm headed to that site to fill up my cart right now lol! Thanks for the coupon code! You're very welcome! :) Enjoy! Hey Jen! This looks like a fun site to check out. Thanks for the info. Just one question where are the palettes made? It's probably a dumb question since at that price point, I'm guessing they're made in PROC. -- Christina D.
This is such a great find, thank you so much Jen! 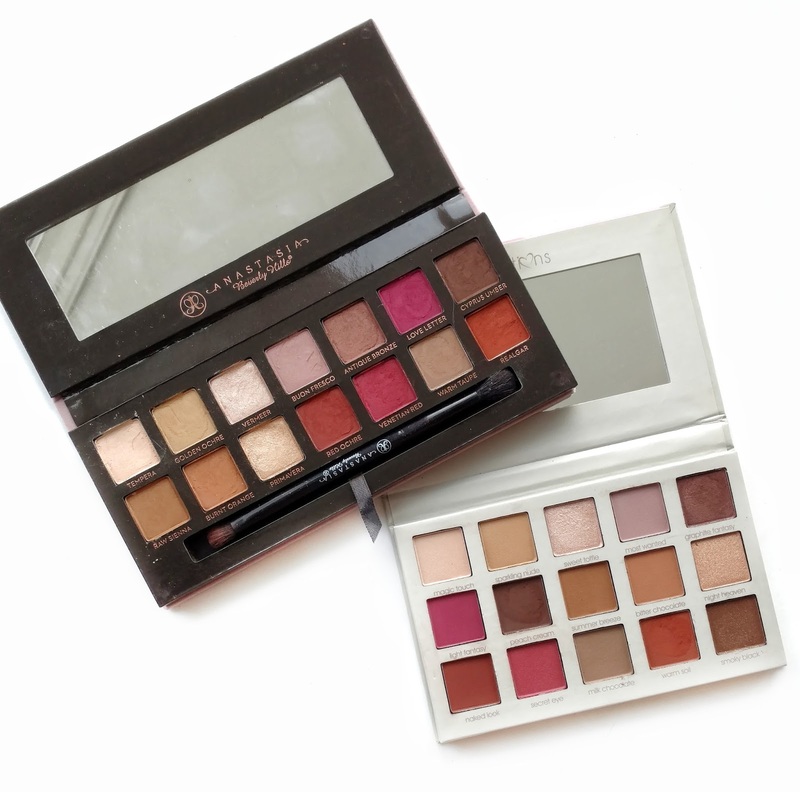 I also heard great things about MR and wanted to buy similar shades (that and the Ciate London Chloe Morello palette.) This is way cheaper and the colors look almost identical to MR. 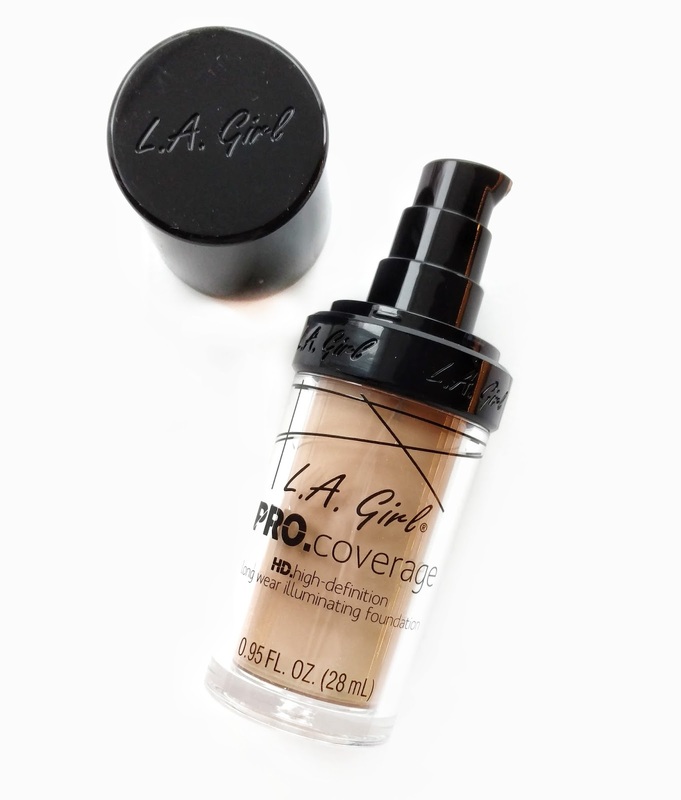 I also bought the City Glow highlighter you rec'd last yr along with the LA girl foundation. I'm about NC 10-13 so hopefully Porcelain will work out well for my skin tone. They have really great deals on their site! I can't wait to order some of the products! 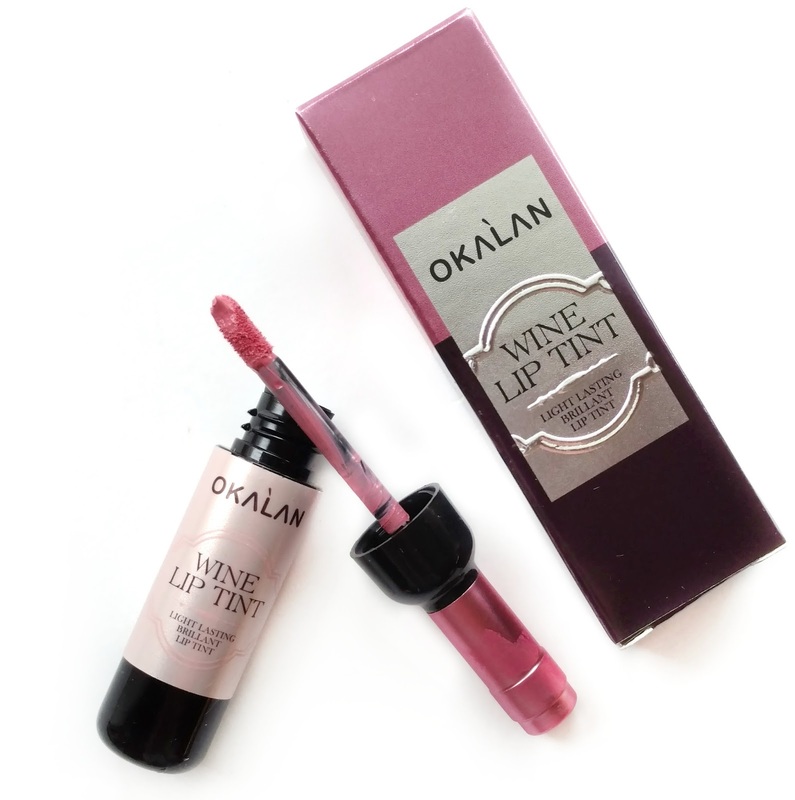 Im really interested in the Okalan brand!!! Have you had an opportunity to test out the eyeshadows? I'd love to hear a more detailed review of them! Hello, does the beauty creations palette have paraben in ingredients? Thanks a lot. Nooooo girl! Do not buy from that site! Everything is fake...even the Beauty Creations palettes, which are NOT expensive in the first place ($15). The brown shades are named night out, til midnight, only yours, and warm touch. Go to the beauty creations site and see for yourself! I wouldn't trust that makeup because they copy another company's box and you have NO IDEA what the actual ingredients are....please be careful!!!! Your code is 10% off not 15%. Hi! I'm a little late to this article but I have recently discovered your blog and the Hush site! Love both! 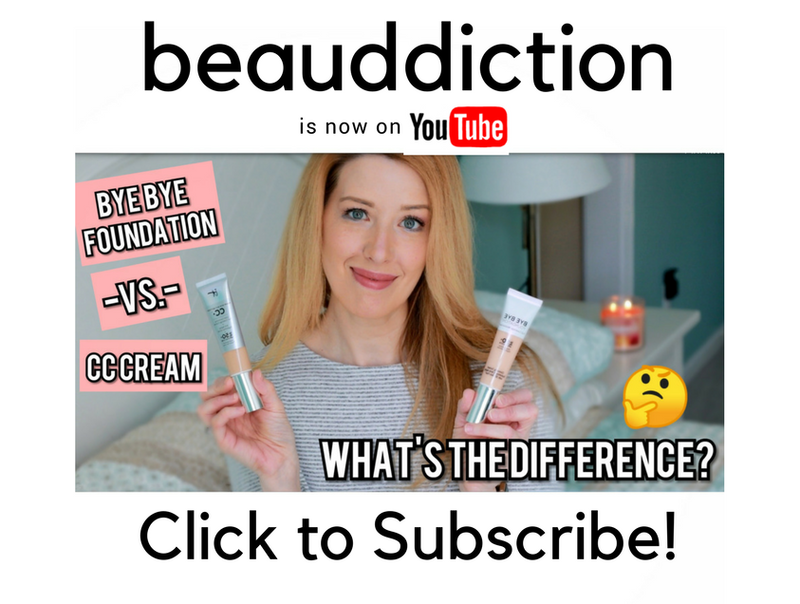 I have a mix of high end and drugstore products but definitely more high end so these dupes have been eye opening!! I never thought dupes could be as good but I bought the Aphrodite palette for $10 after eyeing the Huda Rose Gold one and I love the dupe!! I saved $55 and got an amazing palette that performs just as well!! I just ordered the Beauty Creations dupe of the Too Faced Boudoir and can't wait for it! $7.99 instead of $30?? Yes please!!! Sorry for the long post!